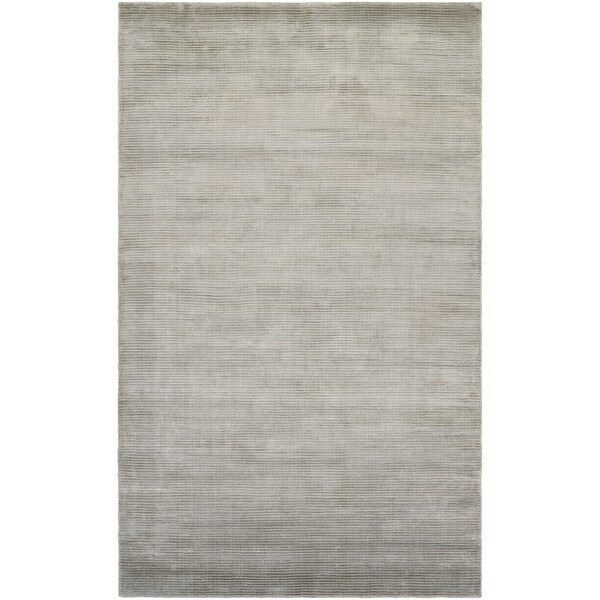 Delta Rock Cove Gray Area Rug - 2' x 3'7"
Style enthusiasts who appreciate sophisticated looks on the cutting-edge of design trends will fall in love with the fresh aesthetics of the Sagano Collection. A truly unique collection, these hand-knotted area rugs feature a 100% hand-spun bamboo pile (select designs are accented with wool highlights). This all-natural, eco-friendly fiber is highly durable as well as lavishly soft and is considered one of the best renewable resources in the 'green' category. Sagano area rugs are made using a time-honored weaving technique, known as an Indo-Nepalese weave, which brings further artisan-crafted appeal to the collection. Offering a versatile range of transitional-contemporary patterns, from Ikat motifs to flowing florals, Sagano area rugs have a distinctive water-color effect that adds a muted glow to the entire surface. Utilizing a soothing palette of warm and cool tones, these breathtaking floor fashions showcase modern colors, including Lilac, Grey, Azure, Chocolate and Cream. Ideal for rooms that have an eclectic flair, the Sagano Collection has an upscale feel that perfectly complements luxurious fabrics and provides a visual point of interest that inspires a creative environment. Dimensions 48.0 In. X 24.0 In. X 0.16 In.